Stephen Dykes Bower (1902-1993) was unique among twentieth century British architects as a sincere practitioner of Gothic design during the post-war period. This book has been commissioned as part of a series of books on Twentieth Century Architects by RIBA Publishing, English Heritage and The Twentieth Century Society. Stephen Dykes Bower (1902-1993) was unique among twentieth century British architects as a sincere practitioner of Gothic design during the post-war period. He rejected modernism and continued traditions from the late Victorian period, with an emphasis on fine detail, craftsmanship and bright colour, creating vibrant interiors in both new and old buildings. He built four completely new churches, including the remarkable, richly-patterned St John’s at Newbury, and at Bury St Edmunds his extension of a parish church into a cathedral was spectacularly completed in 2005 with the addition of a crossing tower, designed by Warwick Pethers, the last of his assistants. Most of Dykes Bower’s work was in the context of older buildings, including Westminster Abbey, where he cleaned the grimy stonework of the interior and added sparkling colour to the monuments. At St Paul’s Cathedral, he created the sumptuous high altar and baldacchino. Parish churches across England bear witness to his skill and care, and to the team of craftsmen in silver, iron, stone and decorative painting who carried out his designs. He gave his time to help clergy make beautiful churches the focus of social regeneration in Salford and Moss Side, often finding homes for beautiful fittings thrown out of other churches. 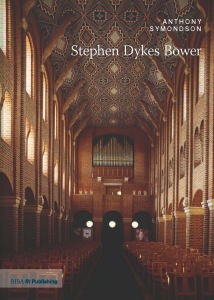 Although Dykes Bower seemed at odds with most of his contemporaries, the current trend for ‘New Ornamentalism’ in architecture gives his work a particular relevance and the book reveals his skill in decorative design and its composition in space to a new generation. This book by Anthony Symondson is the result of many conversations with Stephen Dykes Bower and people who knew and worked with him. It follows the same author’s major study, Sir Ninian Comper (2006), which was one of Waterstone’s best-selling architectural books, and it will appeal to lovers of churches and their decoration, and to professionals involved in church design and conservation. This book has been commissioned as part of a series of books on Twentieth Century Architects by RIBA Publishing, English Heritage and The Twentieth Century Society.